In New York City, Jimmy Olsen is being led on a search to find Jason Todd. Superman is in space and uses his vision powers to tell Jimmy which way to go and radios the information to Jimmy using Jimmy's Superman Signal Watch. Jimmy comes on a locked door and Supes uses his heat vision to melt the lock. Jimmy hides and takes pictures of Jason taking down a group of high-tech ninja. Jason knows Jimmy's there and tells him to come out after he's done killing the ninja squad. Jimmy talks to Jason about Duela Dent (a.k.a. The Joker's Daughter). Jason tells Jimmy about the events of "Countdown #51" and the alien who killed Duela and referred to her and Jason as "incongruities that must be purged." Jimmy says he doesn't understand why an alien would murder Duela without reason. Jason suggests he go talk to the Joker, who "wrote the book on crazy." Meanwhile, in Greenwich Village, Mary Marvel consults with Madame Xanadu for help finding Freddie Freeman. Though Xanadu doesn't have any information about Freeman, she does tell Mary that she's going to be tested, and that, if she regains her old power or gets any new power, she has to stay out of Gotham City because it's no longer safe for magic. Mary doesn't understand and says she's more lost than she was before. Xanadu tells her to look for a guide. Karate Kid fights Batman though KK claims he's Trident. KK takes Batman's utility belt. Black Lightning knocks KK out with his powers. In Keystone City, The Flash's rogues are gathering under the leadership of the new Flash's rogue Inertia. The rogues are hanging out, snorting lines of what appears to be either cocaine or crystal meth. Mirror Master harasses Pied Piper and Trickster about their fickle allegiances - they both spent time as allies of the Flash, not rogues. The fight's broken up by Heat Wave who compares Piper and Trickster to Senator John Kerry. Mirror Master tells the Rogues there's a meeting tomorrow at Midnight but that they're going to need a display of loyalty from Piper and Trickster before they're let in on the plan. Finally, in Gotham City, at Arkham Asylum, Jimmy Olsen has taken Jason's advice and gone to see the Joker. He tells Joker that his daughter is dead. Joker feigns sadness. Jimmy thinks Joker knows nothing but Joker tells him he isn't seeing the big picture. The Joker says "It's a universal conspiracy, Jimbo! It is all around us, something's not quite right with the world! Haven't you noticed? Haven't you felt it?" Joker tells Jimmy his daughter isn't dead - because he doesn't have a daughter. On his way out of Arkham, Jimmy calls Lois to fill her in but, behind him, a crazed Killer Croc has broken loose and is about to attack him. Story - 2: So far this story is a lot of nonsense and, like last week's reviewer, I too blame DC's lack of continuity. Duela Dent has been portrayed so many different ways over the past 10 years in her rare cameos. Last time I remember seeing her, she was overweight and past her prime. Yet when she's off-ed in the 51st issue last week, she's obviously quite different. Is this a result of the Crisis? Is she from another Earth in the new Multiverse? Or is none of this actually taking place on DC's mainstream "New Earth"? Enough of this ambiguity DC. I'm thrilled the Multiverse is back but, at the same time that it's reintroduced, you create the idea that there have been massive changes on New Earth that most people are unaware of. I can't care about a murdered Duela Dent if I don't know which Duela Dent we're talking about. Specifically on the subject of this homepage, Superman, the Man of Steel I know and love would never send an unarmed Jimmy Olsen to a face-to-face meeting with someone as unpredictable as Jason Todd. If Superman has the ability to find Jason and watch him from space with his vision powers, he would never just watch as Jason murdered the ninja in cold blood. And if Superman has the ability to find Jason Todd that easily, it'd be Batman he'd be giving that information to, not Jimmy Olsen. Overall, a very disappointing issue. DC can put this back on track - but it's time to let the readers know more of what is going on behind the scenes. Keep your characters in the dark about doppelgangers and the like but, if you don't start filling in your readers what the heck is going on, you're going to end up pushing them to yet another Earth - Earth Marvel. Art - 4: At least it's a pretty book and I'm sure other Superman fans enjoyed that two-page spread of Superman in space as much as I did. But, again when it comes to continuity, does Superman wear a yellow belt with a round buckle or an S-emblem shaped buckle? Make up your minds. 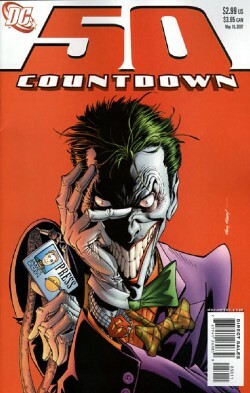 Cover Art - 5: Such a great cover that DC's been using it to market this series.